Aladin graduated from Art Institute of Industrial ceramics in the mid-1950s and worked in Riihimäki Glass Oy in 1959-1976. He designed the company household glassware, as well as to export models, which were sold in particular in Germany. In the 1960s more than half of manufacture’s vases was designed by Aladin. 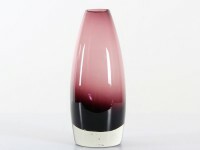 Among the best known produced were the “Disk vase”, in years 1968-1976, as well as the 1970s production was the “Coral” series. He designed for the companyunder its own namein over 150different items, but in reality the numberis higher,becauseof theall Aladinmadeanonymously. In addition to Riihimäki glass design, there is also glass bottles Marlille. Tamara Aladinleft thework ofglassin 1976,whenthe Riihimäkiglassstoppedthe productionof blown glass. Today he lives inHamina. Aladin production has been featured, among other things, at the Finnish Glass Museum in Riihimäki in 2010, as well at the Museum of the City of Hamina in the summer of 2012.